“Passenger lands plane after pilot falls ill” this titles caught my eye on CNN.com. However, I thought the lead that followed was much less interesting than this title. The leads lets the reader know that the plane was small and only had the pilot and passenger on board. I think this lead was meant to build some drama and cause the reader to continue in the story, which is does, but it also causes confusion. I don’t know what a “Cessena plane” is and I think that most people don’t. The lead is also misleading. At the end of the article we find out that the passenger has flown and aircraft before, just not this specific type. This takes away a lot of the drama that was originally in this piece about the miracle landing. I thought this article was interesting. I read the whole thing wanting to know what happened but by the end I was given less than I had expected. The incident was not as exciting or treacherous as it seemed when I pictured a passenger landing a large plane full of other people. I think the roll of the pilot is also confusing, which is not the fault of the author. I want to know what happened to the pilot to lead to his death. If he was that sick, why was he flying the plane in the first place? This is an interesting story, that unfortunately just doesn’t have all the facts that it needs. There were many differences between the video story and the print story on the CNN website regarding the shooting and high speed chase at the Capitol last week. The stories were both posted on the same day but contained many differences. The biggest different between the two stories was the focus. The video story was focused on the events that occurred and the questions surrounding the incident and the woman driving the car. The print story focused on the woman and her history of mental health issues. These are to very different main points. While the video leaves the viewer still unsure of what exactly happened and why, the print story leaves the reader with questions regarding the woman’s intentions. The leads of the stories were also somewhat different. The video lead gives us the main information, like who, what, when, and where. However, the lead also brings up the Navy yard shooting that occurred two weeks ago and tries to draw a connection. However, this connection is never made throughout the remainder of the story. The lead also leaves the question of why for the audience to try and piece together. The lead of the article was almost the same, minus the part about the Navy yard shooting. It just give us the name of the women and the fact that police are still trying to piece together what happened. Both stories try to make strange connections. The video tries to tie the incident to the Navy yard shooting, with no real evidence that the two incidents are connected. The print story ties in the woman’s boyfriend and her past mental health, before giving the reader all of the information regarding the incident. Quotes are used in the print story from the boyfriend and sister of the woman who caused the incident. The article seems to be trying to make the case that the woman was mentally unstable and planned to do this. Quotes are used in the video from the U.S. Secret Service Spokesperson and eyewitnesses. This story seems to be trying to convey the confusion regarding the incident. It provides the audience with more information than the print story. The two stories combined together almost seem to make a more through story. The the incident is explained and the background history of the woman involved is provided. This all together gives a somewhat clearer picture of what happened. This article was about the current government shutdown. The article describes Obama’s desire to not give into the wants of a small group of extremists. He is willing to negotiate if they are. He believes there is a precedent at stake regarding the acts of a small group of extremists and their power to control an outcome. Whether it is extreme Democratic or Republican views he doesn’t want a precedent to be set where they can stop important political processes because they refuse to negotiate. The article describes different strategies the Republicans are going through regarding the issues at hand. Some are in favor of the shutdown and some want it to end. The biggest problem comes with the opinions regarding the debt ceiling and Obamacare, issues the two parties will probably never agree on. The need to for a compromise, not an agreement. I thought this was a very informative article. I was written in way that handled the political issues relatively well. I don’t know much about politics myself but I was able to pretty much understand the issues and what is at stake. I think the article may have strayed a bit from the title “Obama Sets Conditions for Talks: Pass Funding and Raise Debt Ceiling”. Although the article goes into more detail on what the Republicans and thinking and doing than the President this is probably necessary. The article brings up the important struggle that is going on between extremist Republicans and Obama right now. It was interesting to read and gave me a lot of information but there is no outcome. I’m not sure what to take from this article. I feel a bit worse about the situation having this information than I did before I read the article. It mostly leaves me just as frustrated with the situation and a group to direct my frustration towards. 800 student volunteers, four hours, and a lot of hard work is what made up this years Into the Streets event day. 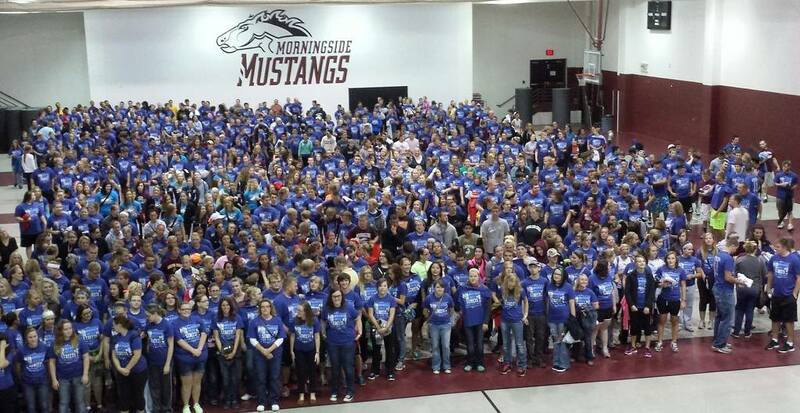 For the past seven years the student body at Morningside College has participated in an all campus event day focused on volunteer service in the Siouxland Community. Volunteer students are sent out to different organizations and agencies in the Siouxland Community to help in any way they can. This tradition has grown in size over the years, to include two thirds of the Morningside student body and many organizations in nearby cities. Students have done many different activities over the years, ranging from playing with kids to prairie cleanup. Into the Streets has become such a well-known event that organizations look forward to the help all year. Some organizations are able to save weeks of work on this day due to the volunteers. 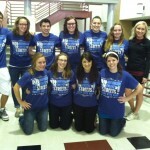 This volunteer service day sets Morningside apart from other colleges. Few colleges set out a day during the busy semester for students to volunteer in the community. What also sets apart this day is the fact that these students are simply doing this because they want to. Students are not required to participate and do not get class credit if they participate. 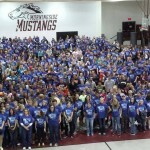 Over the past five years participation has grown from 200 students to 800 students. This says a lot about the student body at Morningside and what is important to them. This is also a really unique event because it is completely student planned. 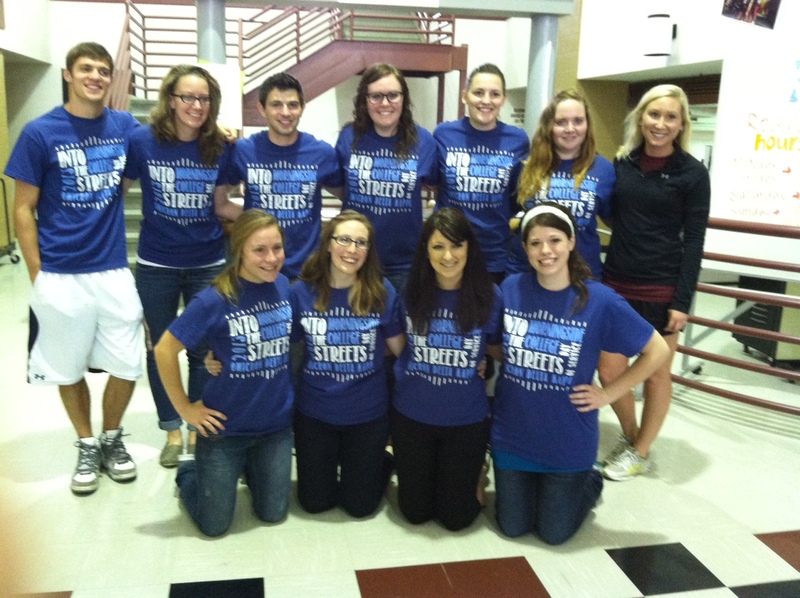 The honor society Omicron Delta Kappa hosts the event every year. This is an honor society for upperclassman students. In this society there is a committee devoted to the planning and preparation of the event. This committee worked tirelessly to find organizations willing to participate, as well as students willing to participate. This may sound easy after six years of positive feedback, but this process takes months. She was co-chairs with Sarah Sorenson and they had a committee of nine people they were able to delegate work to. This committee with the co-chairs called close to 125 agencies in the Siouxland area. This calling takes hours to complete as the committee members are working with the schedules of the agencies. The committee though successfully found 831 slots for students. While this was over the 800 students that signed up, this was a problem that they greatly preferred to have. Past years had more students than slots, which is a harder problem to solve. Into the Streets represents the mission statement of the college. It takes a great deal of work by dedicated students to plan and hard work from the students who volunteer. Overall two thirds of the student body has participated the past four years and plan to continue that trend in the future. What first drew my attention to this article was its title and video. I thought the ground giving way sounded pretty serious. The video shows a group of full size, adult trees slowly moving towards the sink hole and then quickly being sucked down into the water. I had a hard time believe what I was seeing. So I think this article does a great job of catching the readers attention right away. I thought the lead for the story was okay. It almost gave me a little too much in formation. The title of the article was more interesting to me than the actual lead paragraph. I think the rest article though was a good balance of information and personal interest. The article described the situation with the sink hole in Louisiana. Then it gave different opinions from local residents. Some of them are leaving the area and some of them are waiting it out. The majority however, is upset with the way the authorities are handling the situation. It doesn’t seem like a major crisis to them. The article contained a lot of factual information about the situation. I think this information is probably necessary but I don’t think the article needed to take up two pages. I felt like it was getting a bit long at times. I was confused by some of the information. The article mentioned a well breaking and causing a sinkhole, which keeps growing. I believe that is the same sinkhole in the video but the article also mentioned past events that were similar. A little clarification in this are would be good I think. I liked the quotes that were used in this article. I thought they helped the story move on and they were supported. I am interested to find out what happens with this situation at the end of the article. I thought this was a really well written article. It was about the human aspect of large issues rather than the political or economic focus that is normally given. It gave a new perspective to a conflict that everyone seems to be commenting on lately. I think the author Ben Keesey made some great points and made the conflict in Syria a little more relatable for everyone. He mainly discusses relating this conflict to our own lives. He asks the reader to imagine if he or she were in the conflict and facing a chemical weapon. He asks the reader to consider that as a human being our responsibility to help one another doesn’t end because of geographical distance, different religious beliefs, or any other difference. He makes the point that we are all human beings, out lives are all worth the same, and we have a duty to help one another. I think at times the article plays a little to much to the emotional side of the readers. It forces the reader to have an emotional response and so a strong response to the article. This is maybe a good and a bad thing. It gets a reaction from the reader about the article, but it also may cause the focus to be taken off of the actual conflict. I’m not sure that he fully answered the question he began the article with, “The situation in Syria is terrible, but what does that have to do with me”. He doesn’t say what he thinks we should do or why this foreign conflict does have to do with us, but he alludes to some answers. Clarifying some of that, may help the article. I would have liked to hear more of his opinions on the other specifics of the Syrian conflict. I want to know what he thinks the government should do after writing this. As this article is a week old, I also want to know what he thinks of the current decisions that have been made. Many American undergraduate students have never left the United States and never will. Travelling abroad is seen as a luxury, not as necessary. However, in todays day and age a worldview not bound by borders in necessary. A student who is aware and has experienced the world outside of the United States is at a great advantage. A study abroad experience gives all of that and more to a student. The majority of American students do not study abroad despite the many benefits. Joyce Lau from the International Herald Tribune reports that, “Many American students say they would like to go over seas… but only 1% of U. S. students study abroad during any academic year.” However, Unesco reports that there are 3.4 million students on the move each year all over the world, and that number is expected to grow. So, why aren’t more American students studying abroad and taking advantage of the experiences many benefits? Studying abroad more often then not is an eye opening experience. Most students go through a period of personal exploration and growth while abroad. The Institute for the International Education of Students reported from a survey that, “When asked about personal growth, 97 percent [of students] said studying abroad served as a catalyst for increased maturity, 96 percent reported increased self-confidence, 89 percent said that it enabled them to tolerate ambiguity, and 95 percent stated that it has had a lasting impact on their world view.” Being completely immersed in a new culture can be incredibly intimidating, but in the end it opens the students’ eyes to a whole new way of thinking and living. Cultural immersion is a fast and efficient way to teach students that there is a larger world out there. It shows students that there are many different types of people and there are many different cultures. Learning about people and cultures different from oneself creates a global awareness in a student. If a student can prove he or she isn’t ignorant about other people and cultures due to real life experience, it is and invaluable trait for their future. A study abroad experience can also often reshape the career path of a student. Students with an international experience often take a more reflective approach to the role they are going to play in the world. The study abroad experience gives a student new skills that distinguish him or her from other students entering the work field. Diversity Abroad, a leading international organization that provides study abroad experiences, claims there are four major impacts career wise for students who study abroad. These four impacts include: A willingness and readiness to adapt to new environments, an ability to look at a project or situation from different perspectives, an understanding of diverse cultures, and self-confidence with an ability to take risks. Studying abroad prepares a student for a successful future in his or her career path. Studying abroad is expensive. Higher education is expensive. This is the unfortunate truth in the world of education. Many students don’t end up studying abroad because they cannot afford it. However, studying abroad is possible on a budget. The individual students just has to decided if the benefits of the experience will outweigh the hit to his or her bank account. The benefits of studying abroad are costly but if a student takes the time to search for a scholarship, grant, or loan the cost is manageable. A student who studies abroad is more prepared for life after undergraduate school. The study abroad student has already experienced taking risks, problem solving, interacting with new cultures, working under pressure, and successfully navigating the unknown. The student has gone through an important period of personal growth and an accelerated period of learning. While study abroad can seem like a daunting concept in the beginning, it’s benefits and future advantages outweigh the cost and other personal disadvantages every time. If a student is considering whether or not to study abroad the benefits show, the best response is to do it. I recently read an article for my Honors session that I thought was interesting. The article was called How I Passed My U.S. Citizenship Test: By Keeping the Right Answers to Myself and was about the process of applying for U.S. citizenship. The article followed a Canadian woman who was applying for U.S. citizenship. She described the process she went through, mostly about the incorrect questions that are on the written test. She gave the readers the incorrect questions she came across, as well as the different answers that are supposed to be correct. She described advice she was given, to give an incorrect answer even if it was considered correct by the test officials. The woman had interviewed specialists in different fields about the questions to get the correct answers. Many of them weren’t aware that the test included incorrect answers. I thought this was an okay article. I liked that she included interviews she had done with people about these tests and the incorrect answers. However, I wish there had been some sort of resolution to the problem of the incorrect test. She brought up the issues and the wrong answers but she didn’t say why the are that way. I’m wondered why these questions are still wrong after so long. I’m wondering what her article caused if anything with these tests. Are the questions still wrong? I wish she had tried to figure that out so the reader isn’t left wondering. As a study abroad student myself, I know the pros and cons of the experience well. My semester at the Centre for Medieval and Renaissance studies at the University of Oxford in England was my most difficult and most rewarding semester so far. I think the benefits of studying abroad completely outweigh the disadvantages. I think more students should take advantage of study abroad programs at their own colleges and universities because there is no shortage of programs out there. Joyce Lau from the International Herald Tribune reports that, “Many American students say they would like to go over seas… but only 1% of U. S. students study abroad during any academic year.” However, Unesco reports that there are 3.4 million students on the move each year all over the world, and that number is expected to grow. So, why aren’t more American students studying abroad? Studying abroad is expensive. Higher education is expensive. This is the unfortunate truth in the world of education. An undergraduate education is too expensive for today’s students as it is. Add to that a study abroad experience and if a student wasn’t already in debt, he or she is now. If this student wants to go to graduate school in the future as well, there is no shortage of expenses. Many students don’t end up studying abroad because they cannot afford it. However, if a student wants to study abroad, he or she can search out scholarships, find grants, and take out loans. Studying abroad is possible on a budget. The individual students just has to decided if the benefits of the experience will outweigh the hit to his or her bank account. Studying abroad more often then not is an eye opening experience. I was changed after my time in England and I think most students go through a period of personal exploration and growth while abroad. The IES Abroad program reported from a survey that, “When asked about personal growth, 97 percent said studying abroad served as a catalyst for increased maturity, 96 percent reported increased self-confidence, 89 percent said that it enabled them to tolerate ambiguity, and 95 percent stated that it has had a lasting impact on their world view.” Being completely immersed in a new culture opens the students’ eyes to a whole new way of thinking and living. A study abroad experience can also often reshape the career path of a student. Students with an international experience often take a more reflective approach to the role they are going to play in the world. The study abroad experience gives them new skills that distinguish him or her from other students entering the work field. Diversity Abroad claims there are four major impacts career wise for students who study abroad, including a willingness and readiness to adapt to new environments, an ability to look at a project or situation from different perspectives, an understanding of diverse cultures, and self-confidence with an ability to take risks. Studying abroad prepares a student for a successful future in his or her career path. A student who studies abroad is more prepared for life after undergraduate school. The study abroad student has already experienced taking risks, problem solving, interacting with new cultures, working under pressure, and successfully navigating foreign transit. The student has gone through an important period of personal growth and an accelerated period of learning. While study abroad can seem like a daunting concept in the beginning, it’s benefits and future advantages outweigh the cost and other personal disadvantages every time.